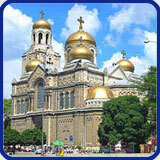 Located just in the heart of Varna, a step away from the beach and the Sea Garden. Open all year round. 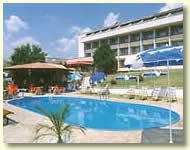 Odessa Hotel offers 3 suites, 90 double rooms (54 with balconies overlooking the sea), 186 beds. There are 6 double rooms, 2 double luxury rooms and 2 studios in this hotel. All of the rooms have TV set, telephone, bathtub, minibar. Hotel facilities: satelite television, security, information, room service, V.I.P., restaurant, bar, private party catering, business-meeting room, rent a car, pets, shop, business centre,elevator, post box, telephone, airconditioned, safe deposit boxes, laundry and dry cleaning. 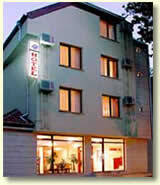 Address: 5 Tzar Samuil St.
Villa JURA Minihotel offers excellent conditions for repose all the year round. It lies in the proximity of the seacoast in a beautiful suburb park leading to the resort complexes: 4 rooms with 2 jointed beds and an option for extra bed independent bathroom to each room, cable and satellite television, telephone, Internet connection; common foyer comfortable for meetings, discussions. The hotel offers accomodation in 6 single rooms, 81 double rooms – 81, 4 suites and 6 small suites. Room facilities include: private bathroom, terrace. Hotel facilities: elevator, security, safe deposit boxes, telephone, information, room service, V.I.P., restaurant, bar, private party catering, parking,pets, folk live show, billiards, outdoor swimming pool, fitness, sauna, medical centre, beach. Open-year-round. Address: Varna 9005 St. Nikola.